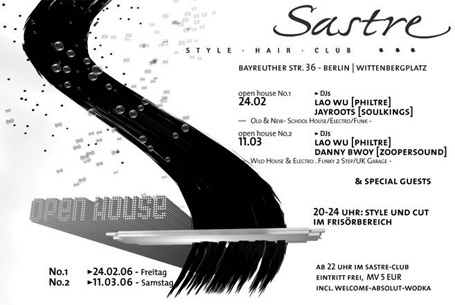 DJ Lao Wu’s new club night „Open House“ kicks off tonight at the „Style*Hair*Club Sastre“ (a combination of hairdresser’s saloon, cocktail lounge and clubbing location) in Berlin-Schöneberg. Be sure to check out the second instalment on Saturday, March 11, when Lao Wu and myself will be celebrating our birthdays with some out-of-control turntable mayhem. Deviating from my regular music policy, I’ll be playing a oldschool UK Garage/2Step set – be prepared to party hard! Check out philtre.de for more info on Mr. Wu’s activities.